Easy Mashed Sweet Potatoes, with butter, maple syrup, cinnamon and Montreal steak seasoning – a perfect combination of sweet and savory flavors! You’ll love these potatoes! The recipe takes only 30 minutes to make – which includes 20 minutes to boil the potatoes! The Montreal steak seasoning combined with butter, cinnamon, and maple syrup make these potatoes truly the very best mashed sweet potatoes you’ll ever have! This recipe is much easier than regular sweet potato casseroles, and it is healthier than many mashed sweet potato recipes as there is no milk and no heavy cream in the ingredients. The sweet potatoes themselves are really so creamy, there is no need for milk or cream. Just add some flavorful seasonings and butter. In this recipe, it is important that you melt the butter together with maple syrup and Montreal steak seasoning for 2-3 minutes before adding it to the already mashed sweet potatoes. This is done to soften the Montreal steak seasoning and to allow the flavors to blend together better. This recipe only gets better the next day, after sitting in the refrigerator, which is all the better, since you can make it in advance! 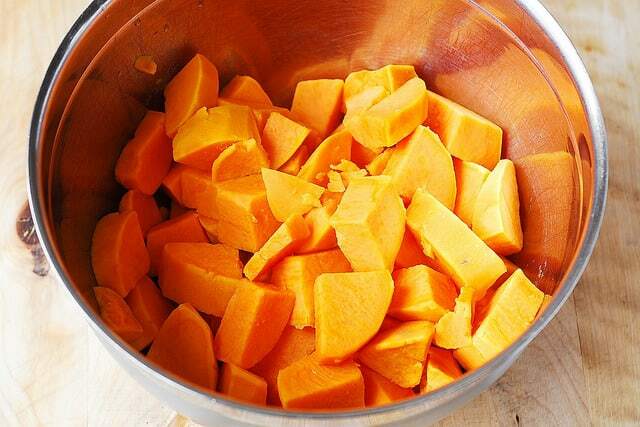 Peel sweet potatoes, slice them into small cubes and cook in boiling water for 20 or 30 minutes, until soft. Rinse and drain. 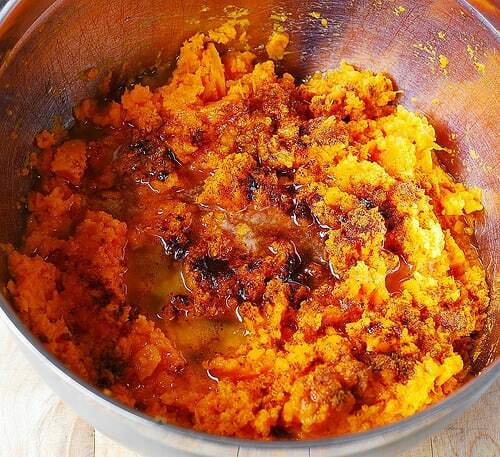 In a large bowl, using a fork or a potato masher, mash sweet potatoes. In the mean time, in a medium skillet or pan, heat butter, maple syrup, Montreal seasoning on small-medium heat, until the butter is melted and cook the mixture for 2-3 minutes on low heat (to soften Montreal seasoning). 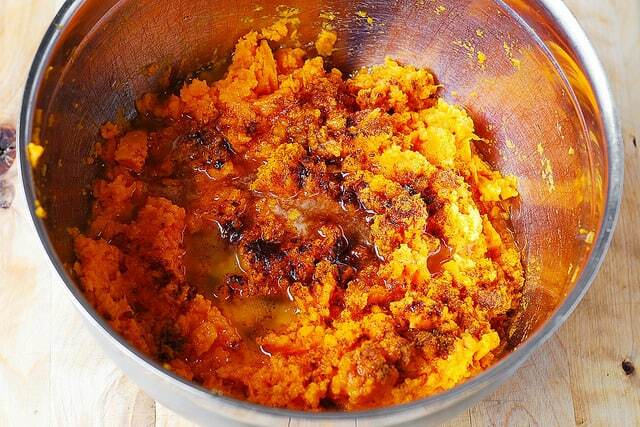 Add the butter-maple-syrup-Montreal-seasoning mixture to mashed sweet potatoes and mix well. Easy Mashed Sweet Potatoes, with butter, maple syrup, cinnamon and Montreal steak seasoning - a perfect combination of sweet and savory flavors! You'll love these potatoes! The recipe takes only 30 minutes to make - which includes 20 minutes to boil the potatoes! In a medium skillet or pan, heat butter, maple syrup, Montreal seasoning on small-medium heat, until butter is melted and cook the mixture for 2-3 minutes on low heat (to soften Montreal seasoning). 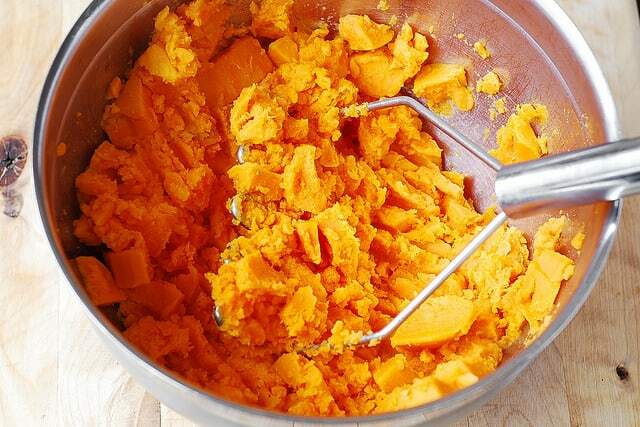 In a large bowl, using a fork or a potato masher, mash sweet potatoes. After the potatoes are mashed, add the butter-maple-syrup-Montreal-seasoning mixture and the cinnamon. Mix well. I just corrected the recipe! 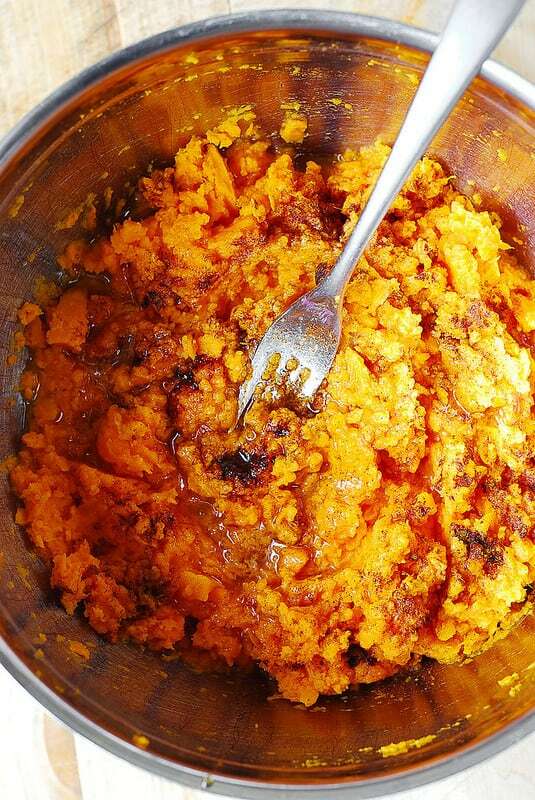 Did you use yams or sweet potatoes in this recipe?